1. Trump bashes TPP: President Donald Trump has renewed his attack on a huge Pacific trade pact just days after raising the possibility of the United States rejoining it. Trump ditched the Trans-Pacific Partnership spanning the United States and 11 other countries shortly after coming into office. The remaining countries went ahead with a new deal without the United States. Last week, Trump asked his top trade and economic advisers to investigate "whether or not a better deal could be negotiated," the White House said. But Trump tweeted on Wednesday that he thought the TPP was a bad deal for the world's biggest economy. 2. Tesla model 3 ambitions: Shares in Tesla (TSLA) climbed higher in extended trading after automotive news website Electrek said the carmaker is aiming to ramp up production of the Model 3 to 6,000 per week by the end of June. The report cited a letter to employees from Chief Executive Elon Musk. Tesla temporarily suspended production of the Model 3 sedan on Monday to work out kinks in its assembly line. The announcement battered the stock, adding to worries about Tesla's ability to scale up. 3. Starbucks racial bias training: Starbucks (SBUX) will close its 8,000 company-owned stores in the United States on May 29 to educate employees about racial bias. The announcement late Tuesday follows an uproar over the arrest of two black men who were waiting for a friend at a Philadelphia Starbucks last week. The store manager called the police. The racial bias training will be provided to about 175,000 workers. 4. 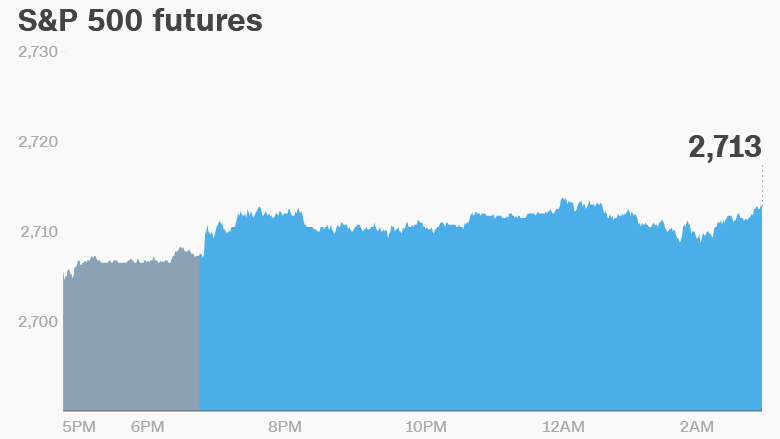 Global market overview: US stock futures were higher early on Wednesday, pointing to a third straight day of gains on Wall Street. Major stock markets in Europe and Asia were also up. The Dow Jones industrial average closed 0.9% higher on Tuesday, while the S&P 500 was 1.1% up. The Nasdaq soared 1.7%, helped by a big jump in Netflix (NFLX) which surged 9% after blowout results. Prices of aluminum jumped to the highest levels since 2011, after Reuters reported that Japanese traders have asked Russia's Rusal to stop shipping aluminum because of US sanctions. 5. Earnings and economics: Morgan Stanley (MSPRE) is set to report its earnings before the opening bell. American Express (AXP) and Alcoa (AA) will follow after the markets close. Shares in British passport maker De La Rue (DELRF) dropped 6% in early London trade after the company issued a profit warning. De La Rue also said it would not appeal the UK government's decision to award a contract to print new passports to a French company instead. US crude inventories data will be published at 10:30 a.m. ET. Oil prices have been volatile in recent days because of tension in the Middle East. US crude futures were 0.9% higher, trading at $67 per barrel. The Bank of Canada's interest rate meeting is scheduled for 9 a.m. ET. Latest inflation data from the UK showed prices rose 2.5% year on year in March, down from 2.7% in February. The pound dropped 0.7% against the dollar after the data was published. Correction: A previous version of this article incorrectly stated UK inflation was 2.8% in February. It was 2.7%.